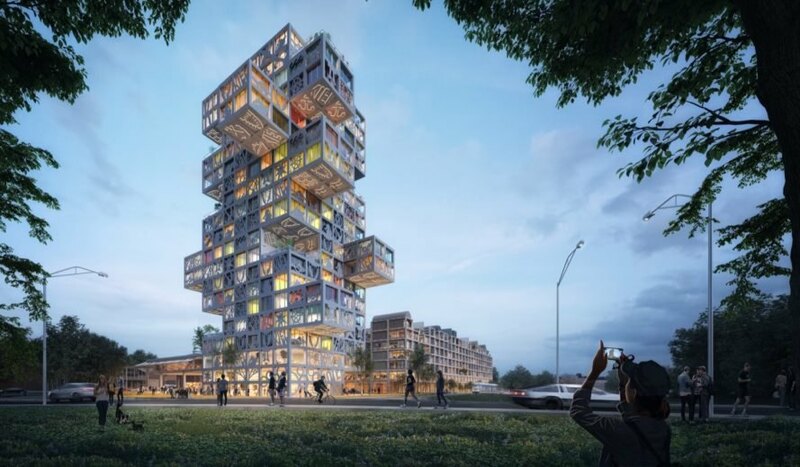 Dutch architecture firm MVRDV has unveiled plans to redevelop a post-industrial city block in Kiel, Germany, into an eye-catching, mixed-use complex that matches the creative spirit of the site’s current tenants. Dubbed “KoolKiel,” the 65,000-square-meter redevelopment project will include the adaptive reuse of the existing single-story W8 Medienzentrum building as well as the addition of a new zig-zagging plinth, office tower and hotel tower. The buildings will also be equipped with rooftop solar panels, rainwater catchment systems, green roofs and other energy-efficient features. Located near the southernmost tip of the Kiel Fjord, the project site is currently home to W8 Medienzentrum, a large, single-story building that was originally used for storing chains for ships and has been converted into an office space housing mostly companies in media and the creative industries. 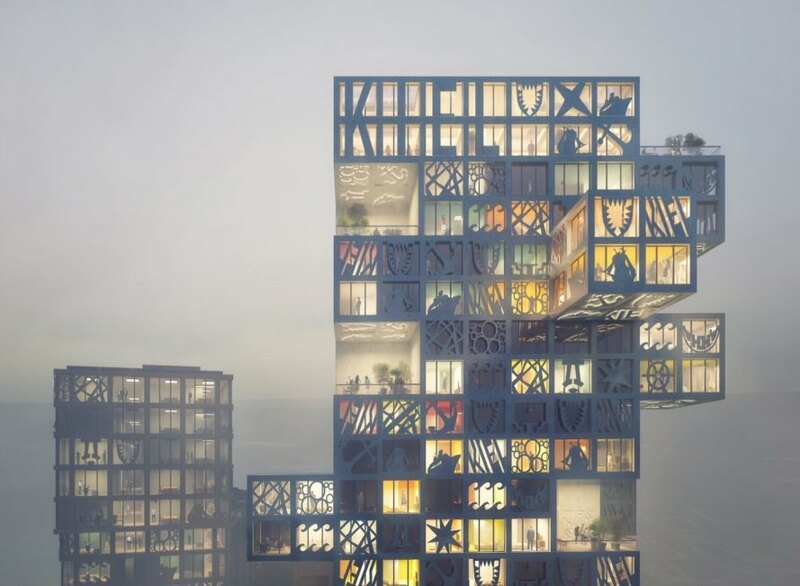 Inspired by the influence of these tenants on the area’s “unique and charismatic” identity, MVRDV has drawn inspiration from the existing community of companies for the KoolKiel design. The proposal will remake W8 Medienzentrum’s existing structure into a mix of commercial units with apartments above, while the new buildings will offer additional office space, a 250-room hotel, more residences, retail and a public event space. Dynamic exterior spaces — from a public courtyard with street furniture to a rooftop park — will connect the various buildings. Creative community input will be key to the project. For instance, the facade, made from fiber reinforced concrete panels, will display icons inspired by creative local businesses and individuals. The flexible design system also gives the community the choice to change many of the interior and exterior elements of the buildings, from the number of cantilevered units on the hotel tower to the size and layout of apartments stacked above the existing W8 building. 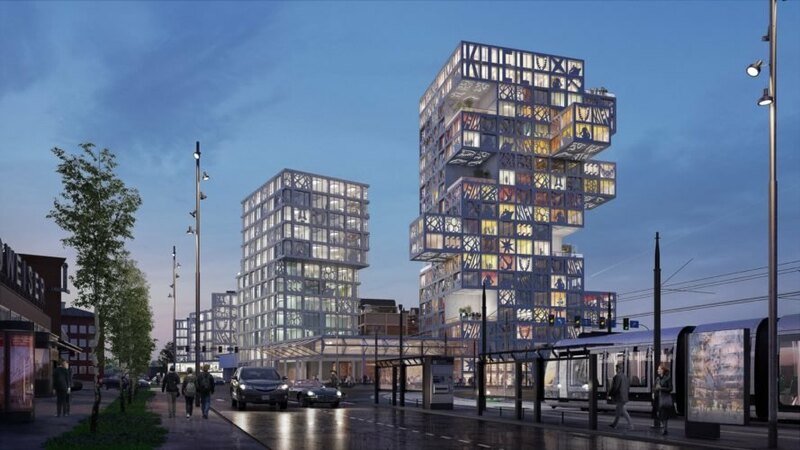 MVRDV has unveiled adaptive reuse plans for a city block in Kiel, Germany. The 65,000-square-meter project will create mixed programming for a creative community. The buildings will be equipped with solar panels, rainwater catchment systems, green roofs and more. The towers will stack like Jenga. The community will lie near the southernmost tip of the Kiel Fjord. The towers will cantilever for a bold, dynamic appearance. The project utilizes energy-efficient systems throughout. The facade will display icons inspired by creative local businesses and people. The towers will include hotel rooms, residences, retail, offices and public event spaces.